4 Space Rack Case - Model # SAR4 , 4 Space Rack , Standard 19" Mounting Rail Width , Outer Dimensions with Doors On: , Height: 9 3/8" - Width: 21" - Depth: 26" , Inside Dimensions: , Rail to Back with Rear Door On: 20 1/2" , Rail to Rear Edge of Case with Door Off: 18 1/2" , Front Rail to Rear Rail: 17 1/2" , Black with aluminum rails , 3/8" plywood , Light weight, Pro design , Heavy duty and ready for abuse , Front and rear removable doors , Has dual 4" steel link locks on both doors , Dual spring handles on each side , Stackable corners , 4 steel L brackets added for strength per side , Steel rack rails - Front and rear rack rails , 24 rack bolts , Very well braced , This rack is brand new. , One year warranty. 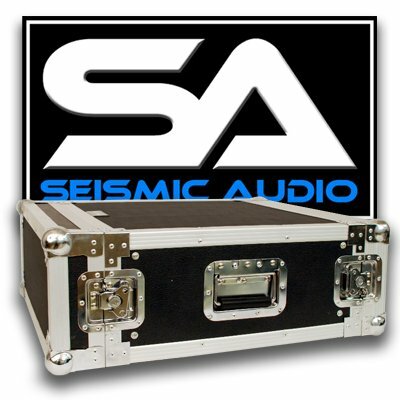 This listing is for one of these Seismic Audio Rack Cases. You will receive one case, pictured and described above. This is a standard 19" wide rack case and will hold common music gear. Navepoint Sliding Rack Vented Server Shelf 1U 19" 4 Post Rack Mount Adjustable 20" - 34"
Arriba Case AC63 Dual Tripod Case 63" x 9" x 6"